کریمی, بهروز, رجایی, محمد صادق. (1394). بررسی کارایی فرایند نانو آهن صفر قرار گرفته روی آلژینات کلسیم در کاهش نیترات از محیط آبی. مجله آب و فاضلاب, 25(5), 67-75. بهروز کریمی; محمد صادق رجایی. "بررسی کارایی فرایند نانو آهن صفر قرار گرفته روی آلژینات کلسیم در کاهش نیترات از محیط آبی". مجله آب و فاضلاب, 25, 5, 1394, 67-75. کریمی, بهروز, رجایی, محمد صادق. (1394). 'بررسی کارایی فرایند نانو آهن صفر قرار گرفته روی آلژینات کلسیم در کاهش نیترات از محیط آبی', مجله آب و فاضلاب, 25(5), pp. 67-75. کریمی, بهروز, رجایی, محمد صادق. بررسی کارایی فرایند نانو آهن صفر قرار گرفته روی آلژینات کلسیم در کاهش نیترات از محیط آبی. مجله آب و فاضلاب, 1394; 25(5): 67-75. استفاده از نانو ذرات آهن جذب شده روی آلژینات کلسیم می‌تواند موجب حذف مطلوبنیترات از آب‌های زیرزمینی شود. هدف از انجام این مطالعه تولید نانو ذرات آهن صفر ظرفیتی در درون گرانول‌های آلژینات کلسیم برای حذف نیترات از آب‌های آلوده بود. در این مطالعه تأثیر فرایند آهن صفر ظرفیتی جذب شده روی آلژینات کلسیم در pH‌های 3 و 4 و 5 و 6 و زمان ماند15 تا 60 دقیقه و غلظت نیترات 20 تا 300 میلی‌گرم در لیتر و غلظت آلژینات کلسیم 5/0، 1 و 2 گرم در لیتر مورد بررسی قرار گرفت. آهن صفر جذب شده روی آلژینات کلسیم دارای راندمان حذف 43 تا 5/68 درصد در غلظت‌های بین 20 تا 300 میلی‌گرم در لیتر نیترات بود. 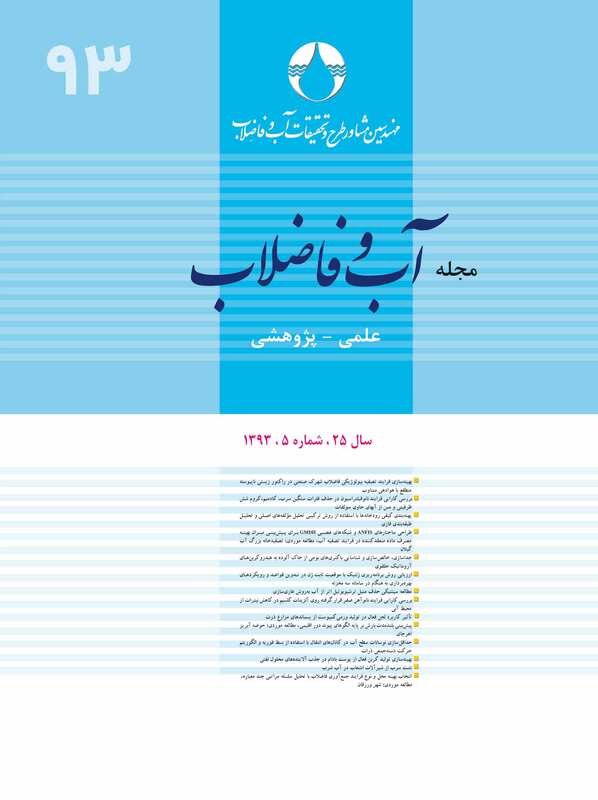 در pH بین 2 تا 10 و در غلظت 1گرم در لیتر آهن صفر ظرفیتی جذب شده روی آلژینات کلسیم، راندمان حذف نیترات به‌ترتیب برابر با 47 تا 72 درصد بود. در pH برابر 2، راندمان حذف نیترات حدود 2 برابر زمانی بود که pH معادل 10 بود. راندمان حذف نیترات در غلظت‌های 5/0 تا 10 گرم در لیتر آهن صفر جذب شده روی آلژینات کلسیم و زمان ماند 15 تا 90 دقیقه، 81-57 درصد بود. از نانو آهن صفر جذب شده روی آلژینات کلسیم می‌توان به‌عنوان بستر برای نگهداری ترکیبات نانوذرات آهن صفر ظرفیتی در آب زیرزمینی برای حذف نیترات استفاده کرد. There is nowadays a growing concern about nitrate pollution in groundwater resources and its adverse impacts on the public health. The present experimental study was conducted to evaluate the efficiency of the Fe° calcium alginate process in nitrate reduction. For this purpose, the effect of Fe° adsorbed on calcium alginate on nitrate oxidation was investigated at a pH range of 2 to10, a contact time of 10 to 90 min, nitrate concentrations of 50 to 300 mg/L and with calcium alginat concentrations of 0.5, 1, and 2 mg/L. Nitrate level in the effluent was measured using spectrophotometry. Results showed that a pH level of 3 and a contact time of 15 min were the optimal values in the Fenton process for nitrate removal. Under these conditions, nitrate removal efficiencies for FeШ, FeІІ, Fe°, FeІІ/Fe°/H2O2, and FeШ/Fe°/H2O2 were 10.5, 27.6, 36.5, 62.3, and 74%, respectively, for a retention time of 90 min, an initial nitrate concentration of 100 mg/L, an iron concentration of 10 mg/L, and a pH level of 4. The results indicate that the corrective fenton process with zero iron nano-particles can effectively reduce nitrate under optimal conditions and that this method can be successfully used for the removal of similar compounds. 1. Fewtrell, L., and Bartram, J. (2001). Water quality: Guidelines, standards, and health: Assessment of risk and risk management for water-related infectious disease, IWA Publishing, USA. 2. Fewtrell, L. (2004). “Drinking-water nitrate, methemoglobinemia, and global burden of disease: A discussion.” Environmental Health Perspectives, 112(14), 1371-1374. 3. El-Sofany, E. (2008). Removal of lanthanum and gadolinium from nitrate medium using Aliquat-336 impregnated onto Amberlite XAD-4.” J. of Hazardous Materials, 153(3), 948-954. 4. Weyer, P.J., Cerhan, J.R., Kross, B.C., Hallberg, G.R., Kantamneni, J., Breuer, G., Jones, M.P., Zheng, W. and Lynch, C.F. (2001). “Municipal drinking water nitrate level and cancer risk in older women: The Iowa Women's Health Study.” Epidemiology, 12(3), 327-338. 5. Pintar, A., Batista, J., and Levec, J. (2001). “Integrated ion exchange/catalytic process for efficient removal of nitrates from drinking water.” Chemical Engineering Science, 56(4), 1551-1559. 6. Schoeman, J., and Steyn, A. (2003). “Nitrate removal with reverse osmosis in a rural area in South Africa.” Desalination, 155(1), 15-26. 7. Sun, Y.P., Li, X., Cao, J., Zhang, W., and Wang, H.P. (2006). “Characterization of zero-valent iron nanoparticles.” Advances in Colloid and Interface Science, 120(1), 47-56. 8. Önal, S., Baysal, Ş.H., and Ozdemir, G. (2007). “Studies on the applicability of alginate-entrapped< i> Chryseomonas luteola TEM 05 for heavy metal biosorption.” J. of Hazardous Materials, 146(1), 417-420. 9. Torres, E., Mata, Y., Blazquez, M., Munoz, J., Gonzalez, F., and Ballester, A. (2005). “Gold and silver uptake and nanoprecipitation on calcium alginate beads.” Langmuir, 21(17), 7951-7958. 10. Ibáñez, J.P., and Umetsu, Y. (2002). “Potential of protonated alginate beads for heavy metals uptake.” Hydrometallurgy, 64(2), 89-99. 11. Rocher, V., Siaugue, J.M., Cabuil, V., and Bee, A. (2008). “Removal of organic dyes by magnetic alginate beads.” Water Research, 42(4-5), 1290-1298. 12. Vı́lchez, C., Garbayo, I., Markvicheva, E., Galván, F., and León, R. (2001). “Studies on the suitability of alginate-entrapped< i> Chlamydomonas reinhardtii cells for sustaining nitrate consumption processes.” Bioresource Technology, 78(1), 55-61. 13. Tam, N., and Wong, Y. (2000). “Effect of immobilized microalgal bead concentrations on wastewater nutrient removal.” Environmental Pollution, 107(1), 145-151. 14. Rhim, J.W. (2004). “Physical and mechanical properties of water resistant sodium alginate films.” LWT-Food Science and Technology, 37(3), 323-330. 15. Rhim, J.W., Lee, J.H., and Hong, S.I. (2006). “Water resistance and mechanical properties of biopolymer (alginate and soy protein) coated paperboards.” LWT-Food Science and Technology,39(7), 806-813. 16. Zouboulis, A.I., and Katsoyiannis, I.A. (2002). “Arsenic removal using iron oxide loaded alginate beads.” Industrial and Engineering Chemistry Research, 41(24), 6149-6155. 17. Bezbaruah, A.N., Krajangpan, S., Chisholm, B.J., Khan, E., and Elorza Bermudez, J.J. (2009). “Entrapment of iron nanoparticles in calcium alginate beads for groundwater remediation applications.” J. of Hazardous Materials,166(2-3), 1339-1343. 18. Kim, H., Hong, H.J., Jung, J., Kim, S.H., and Yang, J.W. (2010). “Degradation of trichloroethylene (TCE) by nanoscale zero-valent iron (nZVI) immobilized in alginate bead.” J. of Hazardous Materials, 176(1-3), 1038-1043. 19. Choe, S., Liljestrand, H.M., and Khim, J. (2004). “Nitrate reduction by zero-valent iron under different pH regimes.” Applied Geochemistry, 19(3), 335-342. 21. Huang, Y.H., and Zhang, T.C. (2004). “Effects of low pH on nitrate reduction by iron powder.” Water Research, 38(11), 2631-2642. 22. Almeelbi, T., and Bezbaruah, A. (2012). “Aqueous phosphate removal using nanoscale zero-valent iron.” J. of Nanoparticle Research, 14(7), 1-14. 23. Liu, T., Zhao, L., Sun, D., and Tan, X. (2010). “Entrapment of nanoscale zero-valent iron in chitosan beads for hexavalent chromium removal from wastewater.” J. of Hazardous Materials,184(1-3), 724-730.